Gottlieb Daimler (17 March 1834 to 6 March 1900) enjoying a ride in the back seat of his 'Motor Carriage', driven by his son Adolf (1871-1913). An outing with the 'Benz Patent Motor Car', the first automobile of the world. Carl Benz (2 November 1844 to 4 April 1929) is on the right-hand side; next to him is Josef Brecht, one of his employees. In 2019, Mercedes-Benz celebrates the birthdays of company founders Gottlieb Daimler and Carl Benz. Today marks the 185th birth anniversary of one of the inventors of the motor car. 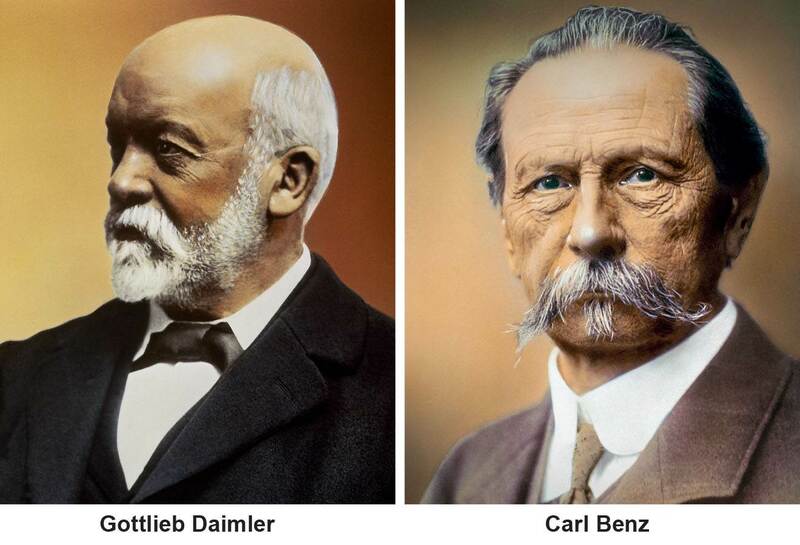 Gottlieb Daimler and Carl Benz were born in the middle of the 19th century in South Germany. Gottlieb Daimler was born 185 years ago on 17 March 1834 as the son of a baker, Johannes Deumler (which is the way their surname was written in those days), and his wife Wilhelmine Friederike in Schorndorf, about 20 kilometres to the east of Stuttgart. And 175 years ago, that is 10 years later, Carl Benz was born in Mühlburg near Karlsruhe as the son of Johann Georg Benz, a locomotive driver working for Baden's grand-ducal state railway company, which had been founded in 1840, and the maid Josephine Vaillant. The parents got married in 1845. 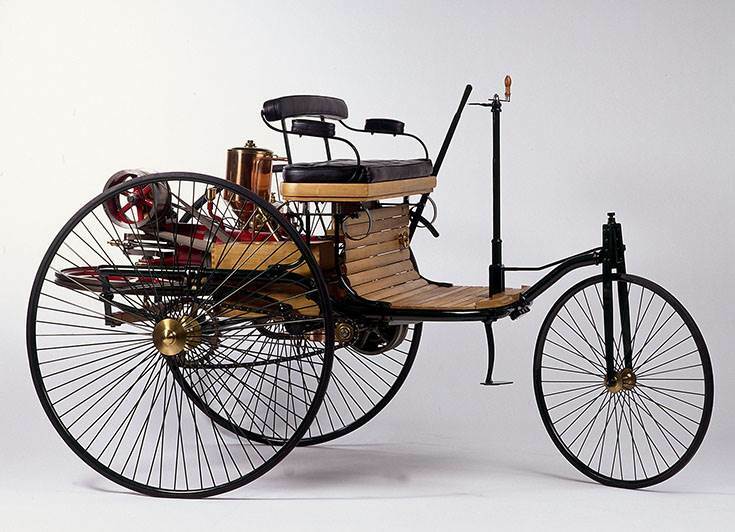 Carl Benz's father imbued his young son with enthusiasm for mobility, but died of pneumonia very early in 1846. A thirst for knowledge, a cosmopolitan approach and foresight shaped the biographies of Daimler and Benz from early childhood. Gottlieb Daimler attended the grammar school and on Sundays additionally the drawing school in Schorndorf. He then gained great experience in precision mechanics as an apprentice to a gunsmith. After passing his journeyman's examination in 1852, Daimler attended the Technical College in Stuttgart. A Württemberg government councillor, Ferdinand Steinbeis, then arranged a job for him in Alsace, where Daimler also received theoretical instruction in preparation for his studies. After the successful graduation the young engineer first worked in Paris in the early 1860s and then during his stays in Olham, Leeds, Manchester and Coventry he became acquainted with the British mechanical engineering industry. As a workshop inspector in Reutlingen, he then met his later companion Wilhelm Maybach in 1864. In 1867 Daimler married Emma Kurtz from Maulbronn. In 1868 he became foreman of the workshop in Karlsruhe. Josephine Benz made it possible for her son Carl (christened Karl Friedrich Michael, but he decided later to spell his name with a 'C') to attend grammar school and then financed his studies. At the early age of 16, Carl, who was fascinated by technology, advanced to the Polytechnic College in Karlsruhe where he studied mechanical engineering. After completing his studies, he worked as a locksmith, draughtsman, master craftsman and designer of iron bridges. In 1871 Benz founded his own company in Mannheim together with August Ritter. With the help of his fiancée, Bertha Ringer (they married in 1872), Benz was able to buy out his partner after business differences. From 1878, he occupied himself with a gas engine as a stationary drive and as a power source for a future horseless carriage. Founded in 1883, the 'Benz & Cie. Rheinische Gasmotoren-Fabrik Mannheim' successfully marketed a stationary two-stroke engine called the 'System Benz'. However, the inventor was already working on a lightweight four-stroke engine as a drive unit for a motor car. The holistic design of the engine and vehicle as a coherent overall system was a groundbreaking innovation. This is how the motor car came into being, which Benz submitted to the Imperial Patent Office on 29 January 1886 as a 'Vehicle with a Gas Engine Drive' for a patent. Patent specification DRP 37435 can be considered to be the birth certificate of the motor car. 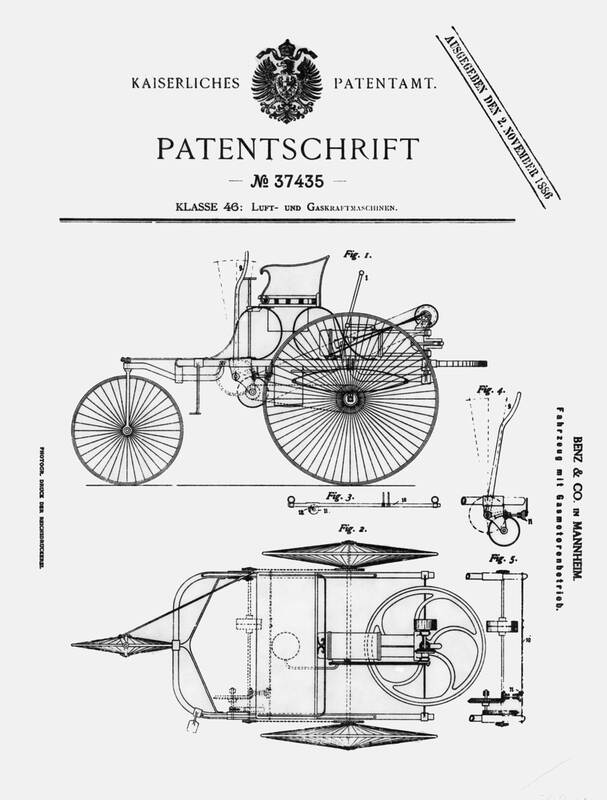 On 29 January 1886, Carl Benz applied for a patent on his 'gas-powered vehicle' (drawings of the design from the patent document pictured below along with the Benz patent motor car from 1886 (replica). At the same time as Benz in Cannstatt Gottlieb Daimler is working on the mobility of the future. In 1872, Gasmotoren-Fabrik Deutz AG appointed him Technical Director. Daimler and Maybach who followed him to the Rhineland establish at Deutz a profitable large-scale production for stationary engines and develop the four-stroke-engine of Nicolaus August Otto to production maturity. However, there were differences of opinion with founder Nicolaus August Otto, and Daimler left finally the company in June 1882. In the spring of that year, he had bought an expansive home in Cannstatt near Stuttgart. He had the greenhouse enlarged with a brick-built extension to set up an experimental workshop. It was here that he, together with Maybach, developed his high-speed four-stroke engine for driving carriages, rail-mounted vehicles, boats and airships. There then followed patents for an engine with an unregulated hot-tube ignition system and valve timing gear (both in 1883). The Daimler engines soon reached speeds of up to 600 rpm, more than three times the usual speed range. The famous single-cylinder engine, nicknamed the 'grandfather clock', was built in 1884, and in 1885 was submitted for patent as a "gas or petrol-powered engine" and, in the same year, fitted to the 'Reitwagen'(riding carriage), a motorbike with a wooden frame. 1886 finally sees the birth of the motor carriage, the world's first four-wheel petrol car. Carl Benz continued to develop the patent motor car. He, too, experienced the greatest initial interest in his invention in France. Benz ended his active employment with Benz & Cie. beginning of 1903 and becomes member of the Supervisory Board. In 1906, he founded the 'Carl Benz Söhne' company at his new residence in Ladenburg. Carl Benz died on 4 April 1929 in Ladenburg, 90 years ago. - Gottlieb Daimler's birthplace in Schorndorf was acquired by the then Daimler-Benz AG in 1979 and after a costly restoration opened it to the public in 1981. An exhibition there shows models, documents and other exhibits on Daimler and his work. - The Carl-Benz House in Ladenburg became the family home in 1905. It was bought by Daimler-Benz AG in 1985. Since 1986 it has been the seat of the “Gottlieb Daimler and Karl Benz Foundation”. - The experimental workshop in the greenhouse of the garden house at the Daimler home in Cannstatt was opened as a place of remembrance in 1940 and restored in 1984. Today, the Gottlieb-Daimler memorial site houses a small museum.